This post is part of our series of political cartoons by historian and illustrator Mark Wahlgren Summers, author of The Ordeal of the Reunion: A New History of Reconstruction. 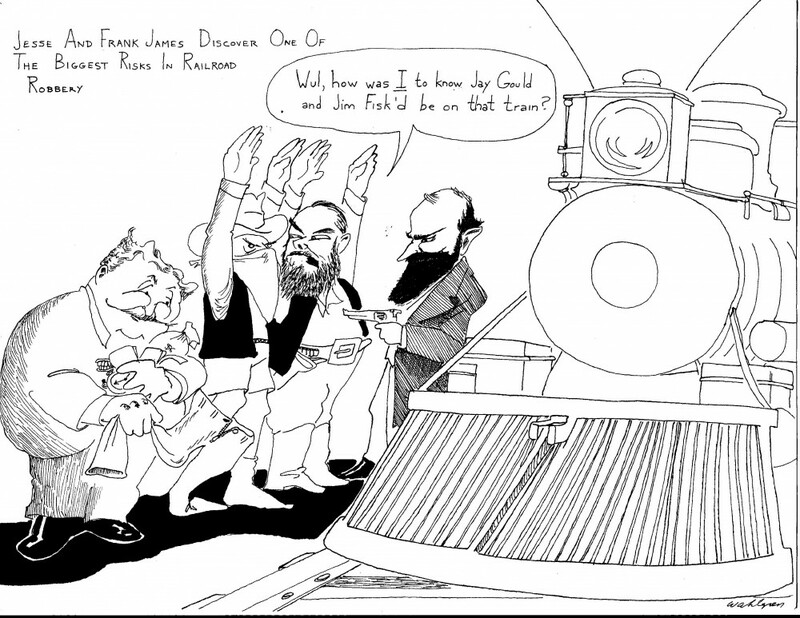 On Thursdays, we feature a new cartoon—hand drawn by Summers—that offers a creative, satirical spin on Reconstruction history. Each cartoon is accompanied by brief commentary from the author/illustrator to help put things into context. These cartoons stimulate your brain, tickle your funny bone, and bring history to life in a whole new way. “Jesse and Frank James Discover One of the Biggest Risks in Railroad Robbery.” Most people think of the Wild West and Reconstruction as if they were separate eras. They weren’t. The Abilene Trail began just as Congressional Reconstruction got under way. Jesse James’s gang grew out of Civil War bushwhackers; the great failed bank robbery in Northfield, Minnesota, took place just as South Carolina and Louisiana freedpeople were fighting for their lives and right to share in the political process in 1876. Custer’s last stand happened barely a fortnight before a quite different massacre in cold blood of black militiamen in Hamburg, South Carolina; and that same summer James “Wild Bill” Hickok was felled from behind in Deadwood, South Dakota. He was holding aces and eights, a combination since known for that reason as the “dead man’s hand,” and perhaps the main reason why he would be inducted into the Poker Hall of Fame in 1979. But the James Brothers were pikers when it came to railroad robbery. The biggest thieves sat in corporate boardrooms, notably Jay Gould and his partner Jim Fisk, who looted and ruined the Erie Railroad and swindled rival railroad chief Cornelius “Commodore” Vanderbilt out of tens of thousands of dollars. Like Jesse James, Fisk was shot to death, though in his case his mistress’s other lover did the deed. Gould went on to become a railroad builder and consolidator and the most hated of all the so-called “Robber Barons” of the later 1800s.